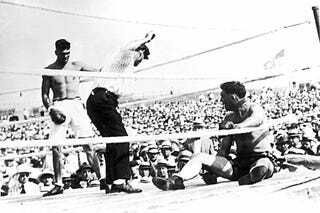 Never in all the history of the ring, dating back to days before all memory, has any champion received the murderous punishment which 245-pound Jess Willard soaked up in that first round and the two rounds that followed. While Dempsey gave one of the greatest exhibitions of mighty hitting anyone here has ever seen, Willard, in a different way, gave one of the greatest exhibitions of raw and unadulterated gameness. He absorbed enough punishment to kill two ordinary men and only his tremendous vitality and that hack of the bell carried him beyond the first round. About ten seconds before the bell closed the first round, Willard reeled over toward the right corner, away from Dempsey, and there the Colorado slugger, putting everything he had into a right hook, dropped the champion for the seventh time. As Willard flopped on the occasion nothing but the bell could have saved him. He sat there dazed, bewildered and helpless—his big, bleeding mouth wide open, his glassy bloodshot eyes staring wearily and witlessly out into space, as a 114-degree sun beat down upon his head and that was rank with perspiration and blood.